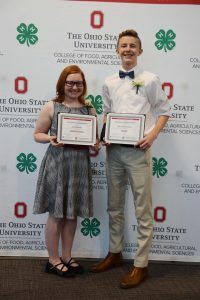 Licking County 4-H is so very proud of these two… Both Sarah Decker and Sean McCutcheon were recognized during the Ohio 4-H Awards Banquet with state project awards. Sarah was selected as the State Health & Safety Award Winner, while Sean was selected the State Sheep Award Winner. This is a tremendous honor! They will travel with Ohio’s delegation in November to attend the 2018 National 4-H Congress in Atlanta, Georgia.